Believe it or not, this has been the look of our patio doors off the kitchen since I moved in. You see, my husband (who wasn't my husband then) bought this house and lived in it for three years with a roommate before we got married and I took up residency. It has a few elements left from its bachelor pad days - such as this lovely window treatment - that just never get to the top of the priority list. 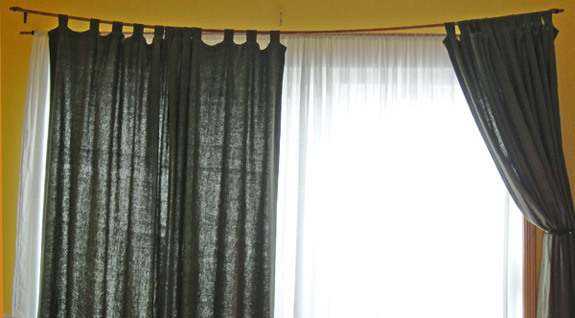 This weekend, curtains made it to the top of the list (and I'm loving the happy result!). The "before" look was created by the previous owners of our home. Note the stylish copper pipe-rods and broken anchor bracket. Later we found the failed mounting wood was actually a piece of yardstick...nice. The picture isn't terrific, and we still have some patching to do, but it was such a vast improvement I couldn't resist sharing it with you right away! You like? What projects do you have that just never seem to get done? Hi Lisa, so great to find your blog! Your curtain refresh looks fantastic. I am actually going to be hanging some new curtains in our bedroom. I too am planning on using a double rod system. We'll see how it turns out!